Morganite is the rare pink-orange form of beryl, a mineral family that includes well-known gems such as emerald and aquamarine. Morganite is a good hard gem with a lovely pastel color that has become a popular jewelry stone. Morganite was first discovered in Madagascar in 1910 and named in honor of J.P. Morgan (1837-1913), the American banker and philanthropist, by the New York Academy of Sciences. George F. Kunz, the famous gemologist who headed the geological section of the Academy, said that Morgan was honored especially for his gift of several major gem collections to museums such as the American Museum of Natural History. In fact Kunz, as the chief gemologist at Tiffany & Co, had himself assembled the collection that became known as the second Tiffany-Morgan collection. All the members of the beryl family are beryllium aluminum silicates by chemical composition. The different beryl colors are the result of trace elements. Emerald is colored green by chromium and vanadium, while aquamarine is colored blue by traces of iron. Golden or yellow beryl is also colored by traces of iron. Morganite derives its peach or pink color from manganese, though Morganite specimens typically contain traces of cesium and lithium as well. Morganite, like other beryls, is quite a hard gem, with a Mohs rating of 7.5 to 8.0. Beryl has a refractive index of 1.577 to 1.583 and a density of 2.72. In general, Morganite tends to have much fewer inclusions than emerald, so eye clean specimens are common. Morganite colors range from a peach orange to salmon pink to a pure pink. The color is nearly always a soft pastel and saturated colors are quite rare. Morganite has been found in a number of locations in the world, including Madagascar, California in the USA, Brazil, Mozambique, Namibia, Afghanistan and Pakistan. We have recently cut some very fine Brazilian material with unusually deep saturation. We also have some lighter tones that are very attractive, in a range of shapes and sizes. Morganite has always been one of our specialities and all the gems have been cut to our exacting standards. This month we feature fine Beryls and Tourmalines from our collection, including some new Morganites that we've just cut from some outstanding Brazilian material. A very fine large Morganite oval in a gorgeous salmon pink. This impressive gem has unusually deep saturation for Morganite, with excellent cutting to maximize the color. Guaranteed natural and untreated, this beautiful stone will set up beautifully in your jewelry design. A very fine aquamarine from Brazil with excellent color and a lot of sparkle. Completely clean and fashioned in a portuguese cut for maximum brilliance, this beautiful gem will make a gorgeous ring or pendant. Guranteed natural and untreated. An impressive chrome tourmaline with an open emerald green color with a slight bluish secondary hue. Very clean with excellent brilliance and luster. Elegant shape with a large face for its carat weight. Really a beautiful gem that will make a stunning ring or pendant. Guaranteed natural and untreated. A bright and vivid Fancy Tourmaline in an orangey pinkish-red. This is beautifully clean material that has been expertly cut and polished to produce an impressive and unique gem. A really fine piece for your colored stone collection. Guaranteed natural and untreated. A large Fancy Tourmaline displaying hues of gold, orange and green. This is beautiful crystal which has been expertly fashioned in an elegant square cushion. A unique gem which will make an impressive piece of jewelry. Guaranteed natural and untreated. An outstanding matched pair of Morganites from Brazil, over 10 carats each! Superb color saturation and brilliance, perfectly clean and expertly fashioned in elegant pear shapes. A wonderful set for any collector of fine gems. Guaranteed natural and untreated. Sotheby's Geneva sale in May will offer what they are calling the most valuable pair of earrings in auction history -- two pear-shaped fancy color diamonds, one pink, one blue, offered as separate lots. The "Apollo Blue" a 14.54-carat, fancy vivid blue, internally flawless diamond, has an estimated price of $38 million to $50 million, or up to $3.4 million per carat. The "Artemis Pink," a 16-carat, fancy intense pink, VVS2-clarity diamond, is expected to fetch $12.5 million to $18 million, or up to $1.1 million per carat. 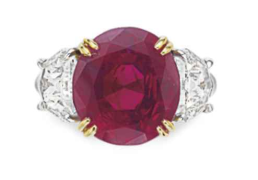 At Christie's Magnificient Jewels sale in New York on April 26, an oval 8.64 ct. unheated Burma Ruby ring sold for $1.99 million, well above the pre-sales estimate of $800,000. Though this ruby was not of the very finest grade -- the 8.62 ct Graff Ruby sold for $8.6 million at Sotheby's in 2014 -- the sale price indicated the strength of Burma Ruby as the top investment in colored gems. The best of the purple garnets from Mozambique have an amazingly vivid color -- an intense purple with red flashes. The color is open and pure, with wonderful brilliance. They also display a striking color change, from grape under daylight to cranberry under incandescent light. The Tanzanian purple garnets are very nice and also show a color change, but the best of the Mozambique material is simply a class above. They are among the most beautiful garnets we've seen anywhere. Spessartite is the gemological name for the garnet which is a manganese aluminum silicate by chemical composition. Manganese gives this gem its distinctive orange to orange-red color and the trade name Mandarin garnet was introduced to refer to specimens with a vivid orange color. But in practice the trade name is applied fairly loosely, so it has become more or less a synonym for spessartite garnet.